Problem: Customer was experiencing high assembly costs due to multiple components required to protect the product from damage; excessive freight costs and storage limitations were also a matter of concern. 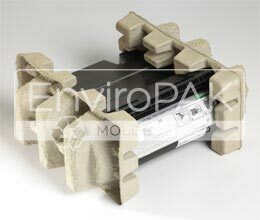 Solution: A custom clamshell was developed, which significantly reduced labor cost in assembly. 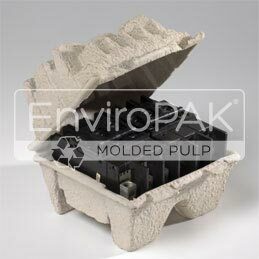 In addition, freight and storage costs were reduced since the new molded pulp trays can be nested in both the empty state and the packaged state. Problem: Customer was experiencing high assembly costs due to multiple folds required for corrugate, and the components in the box did not convey a high quality image. Solution: A custom tray was developed, which significantly reduced labor cost in assembly. 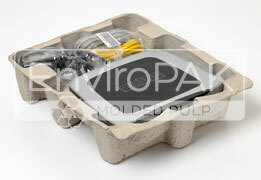 In addition, the tray allowed the components to be organized which improved the perception of quality.